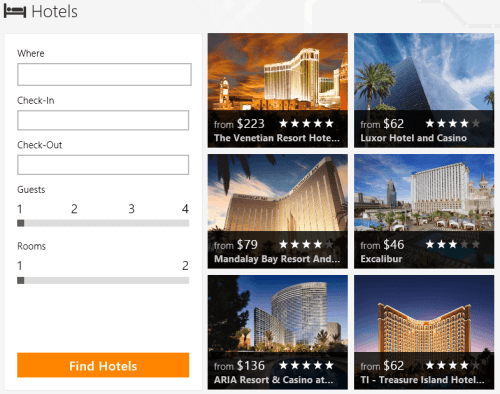 KAYAK For Windows 8 lets you search for flight and hotels worldwide. It must be taken into consideration that KAYAK is a well renowned and well established service provider. 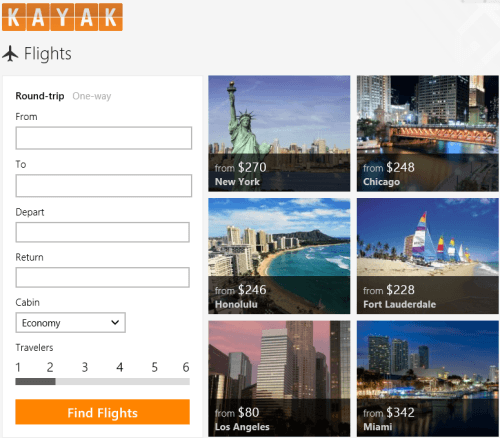 This Windows 8 KAYAK app provides Windows 8 users with highly convenient interface to search for available flights to a particular destination and in getting accommodation as well. On launching KAYAK Flights & Hotels app for the first time you will be shown a prompt about allowing it to access your location. To proceed, you will require clicking on the ‘Allow’ button. After granting the permission you will be taken to the application interface divided into two sections; one for searching flights and other for finding rooms. Each one has been discussed in the section beneath. 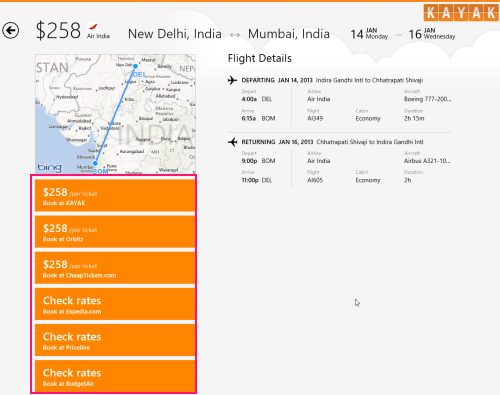 It will be a nice ides to begin with flight search on KAYAK for Windows 8. The form for flight search exists in the left section of interface. Have a look on the screenshot below. On the form you will need entering the origin, destination, date of departure, date of return, and selecting the cabin type. You can also specify the number of travellers using the slider control placed below (the limitation is that you cannot select more than 6 users). Next, you need to click on ‘Find Flights’ button to view the list of the available flights. 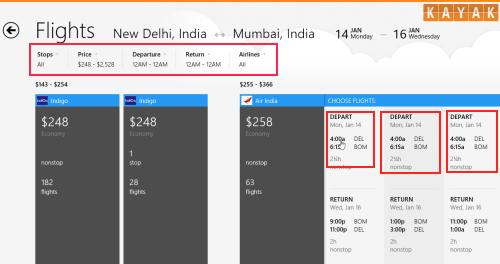 There you will be able to filter different flight on basis of price, time and airline using the panel on top-left section. next, click on particular flight and get its details. Next, you can continue with online ticket purchase by clicking on any of the providers listed below the map. Upon, click you will be redirected to the appropriate webpage on your default web browser. Also, check out our posts on Travel Guide Apps, Expedia, and Expense Tracker Apps. 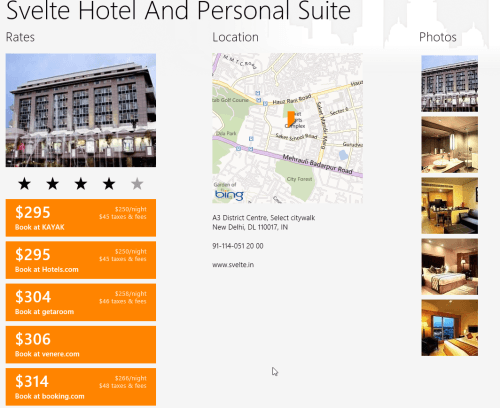 The screenshot below, shows the form for searching hotels. All you need is to type the name of location, select check-in date, select check-out date, specify number of guests and number of rooms followed by a click on ‘Find Hotels’ button. Next, you will be provided with the list of hotels. Open on this link in supported browser followed by a click on ‘View in Windows Store’ button. Next, click on ‘Install’ button after which KAYAK For Windows 8 will install within minutes. 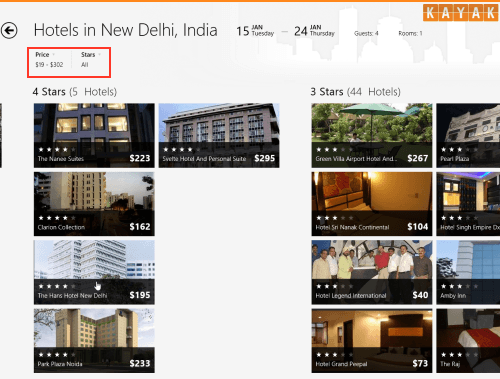 KAYAK For Windows 8 is a really nice Travel app.